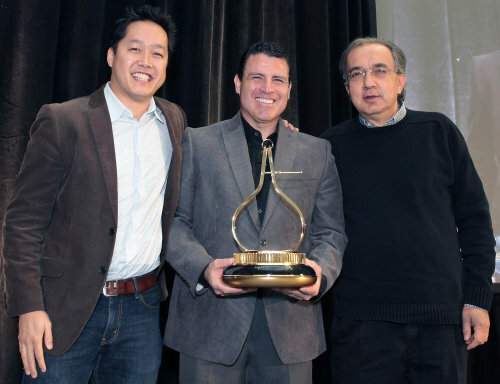 The Chrysler Group claimed a major industry award today when the 2013 Ram 1500 was officially named the 2013 Motor Trend Truck of the Year – a decision based on the power, efficiency and capabilities of the new 3.6L Pentastar V6 and the 5.7L Hemi V8 combined with the new exterior design and the high tech gadgetry that is unique to the Ram Truck lineup. The 2013 Ram 1500 was named Motor Trend Truck of the Year by the well known publication based on six criteria - Design Advancement, Engineering Excellence, Efficiency, Safety, Value and Performance of Intended Function – with only those trucks that are all-new or substantially different from the previous model year. The 2013 Ram 1500 is fully revamped for the new model year with the most significant changes being the introduction of the super efficient 3.6L Pentastar V6, a new 8-speed automatic transmission and a high tech air suspension system that is a segment exclusive offered only by the Chrysler Group half ton pickups. When you add in other fuel saving technology like a start-stop engine program, an active aerodynamic system that includes grille shutters, a thermal management system and the aforementioned 8-speed transmission and the fuel saver system (cylinder deactivation) of the Hemi V8 – it should come as no surprise that the 2013 Ram 1500 is officially the most fuel efficient half ton truck on the market. However, thanks to the powerful Pentastar with 305 horsepower and 269lb-ft of torque along with the 5.7L Hemi V8 with 395 horsepower and 407lb-ft of torque – the 2013 Ram 1500 doesn’t compromise power, towing or hauling capabilities to reach the lofty fuel economy figures. The most unique feature of the 2013 Ram 1500 is the new active air suspension system that has a variety of preset modes that allow for more ground clearance while fording rough terrain by raising the truck while a fuel economy mode lowers the truck for improved aerodynamics. This air suspension system allows the Ram 1500 to accommodate more buyers in stock form without compromising ride quality. On the outside, the 2013 Ram 1500 looks a great deal like the 2012 models but slight body tuning, the active grille shutters, the active air suspension system make this the most aerodynamic truck in the segment while a new set of HID projection headlights add a great high tech look along with offering tons of candlepower to light the way. Inside, the 2013 Ram 1500 includes a new knob-style shifter that was not one of Motor Trend’s favorite features but it joins other exclusive features like the massive 8.4” touchscreen infotainment system. Finally, in addition to the exterior design, the interior goodies, the big power and the impressive level of capabilities – Motor Trend applauded the new Ram for offering so many different configurations and such an impressive price across the nine trimlines.